Need a tow, assistance, or maintenance? Call us. Towing Service ETAs at 30mins or less. 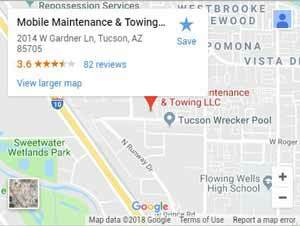 Welcome to Mobile Maintenance & Towing LLC, where we’ve provided over a decade of towing service, mobile maintenance, and roadside assistance to Tucson motorists and heavy truck operators. Our fleet of heavy-lifting tow trucks range from light duty to super duty. We’ll recover your auto after an accident, tow away illegally parked vehicles, haul trailer/trailer combos, and more. And our round-the-clock quality service will get to you 24 hours a day, 7 days a week. Car or diesel problems can come out of the blue. When something goes wrong with your passenger vehicle or truck, your safety depends on the time it takes for a technician to arrive. Our tow trucks can get to you in 30 minutes or less for breakdowns, private party removal (PPR), or accident recovery. Our powerful fleet of tow trucks can pull any type of vehicle, from sedans to super-duty semis hauling heavy machinery. Plus, we’ll tow your vehicle to our shop if the repairs go beyond a simple roadside fix. Plus, we offer emergency towing services and road side assistance. As first responders, we offer emergency tow trucks for accidents, roll-overs, and more. Whether you need a battery replacement, a few gallons of gas, or a simple jump start, Mobile Maintenance & Towing LLC is there in 30 minutes or less with fast roadside assistance. And while other towing and roadside assistance services may charge aggressive fees, our honest competitive prices will get you back on the road at little cost. Mobile Maintenance & Towing offers a wide range of roadside and mobile fleet services. Our ASE Certified Technicians are equipped to inspect and repair diesel or gas engines. On the roadside, we conduct services at a lower cost than a pricy quote from the mechanic. Whether you drive a big rig or a coup, we’ll service anything from transmissions and differential systems to electrical and computer diagnostics. And we’ll check brakes, A/C, and fuel systems. Scheduling your fleet’s maintenance is as important as any deadline your fleet has to make. We understand the value of scheduling fleets for regular maintenance. That’s why we save you the cost by coming to your facility. We work fast to deliver regular oil changes, lube, and filter replacements, and services that will improve your fleet’s fuel economy.